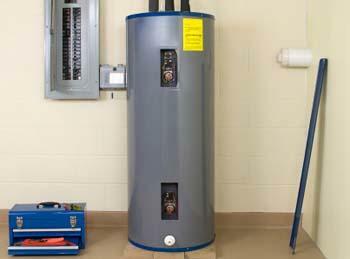 Electric hot water heaters deliver hot water as needed throughout the home's plumbing system. They are an ideal solution in homes where there is no existing natural gas hook-up or in areas where the gas prices are higher than electricity delivery rates. Electric water heaters are available in two different types - the standard tank variety and a newer version known as a tankless hot water heater. While they each use an electric element to heat the water, they're actually quite different in how they operate. Do Water Heater Blankets Save Energy? A standard hot water heater is what most people think of when they imagine a hot water heater. It is a large, cylindrical tank with a copper water supply and delivery pipes connected to it. Large tank versions usually have two internal heating elements. They come available in a variety of sizes, with tanks ranging from 10-gallons up to 100-gallons in capacity. The hot water heater uses a thermostat to regulate the temperature of the water contained in the tank. As hot water extracts out of the tank, the thermostat turns the heating element on to compensate for the change in internal temperature. Throughout the day, the heating element turns on and off as the water temperature fluctuates, regardless of whether or not the you are using the hot water. A tankless water heater system does not feature a large tank of stored water. Instead, these appliances are installed in-line and heat the water on demand. Because of this, these types of water heaters are sometimes referred to as continuous flow, instant-on or instantaneous water heaters. Tankless hot water systems come available in two different styles, smaller units for point-of-use control and larger units capable of supplying the entire home.With a tankless hot water system, when hot water is called for, the unit senses the temperature of the incoming water, heats it until it reaches the desired temperature and then disperses it. Hot water will continue to flow until your turn off the tap, at which time the unit goes into standby mode and the heating element remains off until it is needed again. Electric water heaters have benefits and limitations that can affect one's choice either way. If your local electricity company offers rates based on time-of-use or has lower rates for off-peak hours, a standard water heater may be a good choice, especially if it has a feature which allows you to adjust the tank's heating schedule. A large storage tank can hold sufficient hot water for use throughout the day and the heaters can run only when the rates are at their lowest, thus saving you money. When shopping for a standard electric water heater, check the tank's first hour rating. This number is indicative of the combined capacity of stored hot water plus the heating capacity of the heating elements to sufficiently heat a depleted tank. The first hour rating should be slightly higher than the tank's storage capacity.